Personal insights and opinions from Gensler's global experts on how design innovation creates more livable cities, smarter workplaces and more engaging leisure destinations. 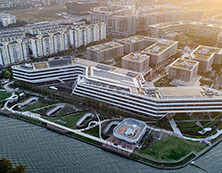 Johnson Controls Headquarters Asia-Pacific in Shanghai combines energy efficiency, building well-being design, and smart technology— pushing the boundaries of sustainability. With a design concept developed around a regional architectural tradition, the Four Seasons Hotel Kuwait at Burj Alshaya brings a new level of luxury to Kuwait City’s skyline. Open plan offices have their fair share of supporters and detractors. Contrary to recent research calling their efficacy into question, Janet Pogue McLaurin argues that an open plan can be just as effective as a private one. What matters is that design aligns with employees’ needs. Just as businesses can benefit from an effective branding strategy, so do cities. By shaping their own narrative, cities can promote urban growth or revitalization. The concept of “selfie walls” has been around for years, but with their growing popularity they have begun to evolve and take on a life of their own. 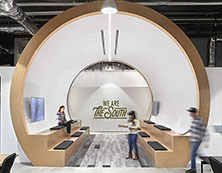 Southern charm and the high-octane world of Red Bull collide for an enthusiastic atmosphere in their new Atlanta office.